Restoring a broken tooth used to be a lengthy and difficult procedure, with the multiple appointments required causing chaos to the schedules of busy people. But there is now another way. CEREC is an in-surgery computer system that creates a crown from ceramic material that's almost identical to the natural tooth, within hours. 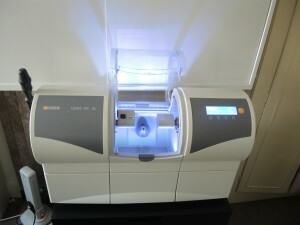 The CEREC system works by firstly taking a digital image of your teeth. The state-of-the-art computer software then designs a bespoke crown to repair the broken tooth. This information is sent to a milling machine to turn the ceramic material into ideal crown for you. The CEREC crown can be fitted in a single appointment as there is no need for your dentist to wait weeks for a laboratory to make a crown. This treatment it is ideal for those who need an immediate solution to a broken tooth. It has already rescued many of our patients ahead of job interviews and special occasions such as birthday parties and weddings. Do you need a crown fitted quickly? Contact Ravenscourt Dental Practice now on 020 8748 4023 or email: team@rdpholistic.co.uk.